Cotton and peanut are major crops in the Southeast, grown on over 10 million acres and worth $16 billion in 2016. Sod-based rotation (2 years of bahiagrass-1 year cotton-1 year peanut) is an economically viable and more sustainable alternative to the traditional cotton-cotton-peanut rotation. Incorporating winter cattle grazing of bahiagrass into the sod-based rotation increases the profitability of the system and results in greater yields and more fertile soil. Plant-parasitic nematodes are threats to cotton and peanut production with yield suppression estimated at up to 10-15 percent in some Southeastern states, or up to $900 million in losses based on the total value of these crops. Many nematodes decline when bahiagrass is grown, suggesting SBR may be a good system for managing nematodes. Additionally, nematodes can infest deep in the soil profile and crop rotation is one of the few practices that affects nematodes at those depths. This study will assess the level of nematode management provided by SBR, particularly if it is sufficient to reduce or eliminate nematicide application. Reducing nematicide application would save growers money and reduce impacts on the environment. In addition to pathogens and pests, agricultural soil contains many beneficial nematodes, fungi and bacteria that do not infect plants. These beneficial organisms fill important roles in agricultural systems such as generating natural fertilizers by transforming nutrients into forms that plants can take up. Some beneficial organisms manage pathogen populations by feeding on pathogens or producing compounds that are toxic to pathogens. Because of these services, beneficial organisms can increase crop productivity and reduce reliance on fertilizer and pesticide inputs. SBR has the potential to stimulate these beneficial organisms because crop rotation, manure addition, and cover cropping — all components of SBR — promote populations of beneficial organisms. Assess the impacts of sod-based and conventional crop rotations on plant-parasitic nematodes and beneficial soil organisms at different depths in the soil profile. Assess whether growers can eliminate nematicide application in SBR while maintaining sufficient nematode control. Determine the impacts of cattle grazing in SBR on plant-parasitic nematodes and beneficial soil organisms. Engage with growers and share research findings through extension efforts. Briefly, for this objective, nematodes and the microbial community are being measured at different soil depths at the research site to assess the impact of sod-based and conventional rotation. This objective is being completed primarily at the sod-based rotation plot research site at the North Florida Research and Education Center (NFREC) in Quincy, Florida. That site is infested with reniform nematode. This study has been in place for nearly 20 years, making it a unique site for sod-based rotation research. Nematodes and microbes are being assessed from separate soil subsamples for each plot and time point. Plant-parasitic and beneficial nematodes will be extracted from 100 cm3 soil using a standard sucrose floatation-centrifugation technique (Jenkins, 1964) followed by quantification using a microscope. Cotton root samples were collected by digging 3 cotton plants from each of 3 locations in each plot (9 plants total). Separate root samples were used for nematode and microbial analysis. Nematodes were be extracted from 3 root systems using a modified blender method (Hussey and Barker, 1973) and quantified using a light microscope. Root samples were collected at midseason for cotton only because the predominant plant-parasitic nematodes of peanut and bahiagrass roots at the site, ring and spiral nematodes, are usually present only in the soil. In contrast, adult females of reniform nematode, the primary plant-parasite of cotton at the site, remain attached to the root along with the egg masses they produce. DNA amplicon sequence approach will be performed to quantify the soil and root microbial communities. After collecting soil or roots as described above, samples will be preserved at -80C for DNA extraction. Total DNA will be extracted from an individual sample using the CTAB approach for root samples and MoBio Power soil kit for soil samples (Liao et al., 2014). Multiplex PCR will be applied for amplicon libraries (Lundberg et al., 2013). To identify the diversity of microbial community, different primer sets will be used to access different community structures of microbes, including 16S rDNA for bacteria, SSU for AMF (Rosendahl, 2008) , and ITS for whole fungal community (including beneficial and pathogenetic fungi). PCR samples will be sequenced using MiSeq v3 300 bp-PE kit at Interdisciplinary Center for Biotechnology Research at UF. The potential activities of extracellular enzymes involved in soil carbon and nutrient cycling will be analyzed using fluorometric and colorimetric procedures on a microplate reader (German et al., 2011). Beginning in 2019, the impact of sod-based and conventional rotations on nematode and microbe populations will also be assessed through on-farm sampling. Three operations, that employ sod-based rotation have been identified. On each farm, we will select 2 fields in sod-based rotation and 2 nearby fields, of a similar soil type, in a conventional row crop rotation for comparison. In each field, 3 five-acre sections will be sampled. In each section, 20 soil cores to 12” deep will be collected in a zig-zag pattern, bulked and mixed. In total, 36 samples will be collected at each time point (3 farms x 2 rotations x 2 fields x 3 sections). Soil samples will be collected before planting, and late in the growing season (August-September). Nematode and microbe populations will be assessed for each soil sample as described above. This objective will be completed primarily at the NFREC-Quincy rotation research site described above. Briefly, nematicide-treated and untreated areas are in place at the Quincy research site and plant-parasitic nematode populations as well as crop yield will be measured in both rotations to determine if nematicide application can be eliminated in sod-based rotation. If crop yields are similarly high and plant-parasitic nematode population densities are similarly low in nematicide-treated and untreated portions of sod-based rotation, then growers that employ sod-based rotation may be able to avoid nematicide application. Similarly, beneficial nematodes and the microbial community will be quantified with and without nematicide application to determine the impact of nematicide application on beneficials. Our hypotheses for this objective were: (1) Sod-based rotation will better manage plant-parasitic nematodes and soil-borne plant pathogens throughout the soil profile than conventional rotation; (2) Beneficial nematode and microbe populations will be more robust in sod-based rotation, particularly deep in the soil profile. All anticipated samples for cotton and the 2018 samples for peanut have been collected at this time. All nematode samples have been extracted. All samples have been counted except those from the final 2 sampling dates. Preliminary analysis has been done on 2017 nematode data and portions of the 2018 data, but final analysis is yet to be completed. Preliminary analysis of the microbial community has been completed on a subset of samples, but work continues to extract and sequence DNA from soil and root samples as well as analyze the microbial community. 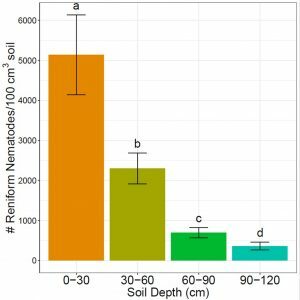 Across all seasons, reniform nematode abundances have been highest in the upper soil profile (0-1 foot) and decreased incrementally as depth in the soil profile increases (Figure 1). Even at 3-4 feet deep in the soil profile, relatively substantial reniform nematode populations reside, suggesting that the most effective management strategies will be effective deep in the soil profile. Reniform nematode depth distribution did not change substantially across seasons, suggesting vertical movement of this nematode in this system may be minimal. 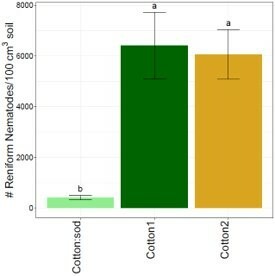 For most seasons analyzed thus far, crop effects have been similar at all soil profile depths and reniform nematode abundances have been greater in conventional rotation, particularly cotton, than sod-based rotation (Figure 2). 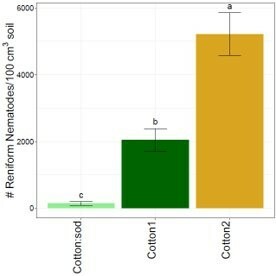 The main exception to this trend is that later in the year, reniform nematode abundances increase in SBR cotton and may be similar to certain conventional phases, particularly peanut (Figure 3). 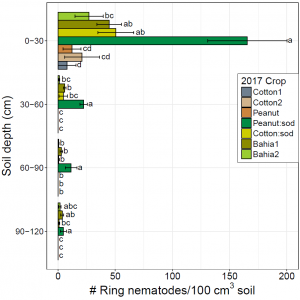 In Fall 2017, reniform nematode abundances varied by depth and crop (Figure 4). 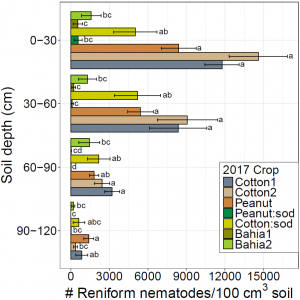 Reniform nematode abundances were generally greater in conventional rotation and sod-based cotton than other sod-based phases, but at deeper depths (particularly 3-4 feet), abundances were more uniform across crop phases. Crop rotation impacts and vertical distribution in the soil profile vary by particular plant-parasitic nematode. For example, ring nematodes are present in this study and are considered a minor pest, particularly of peanut, and have a wide host range. 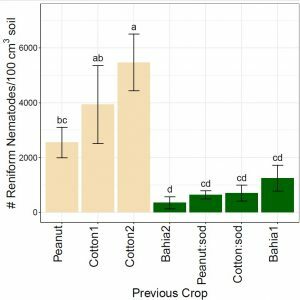 Across seasons, ring nematode abundances were consistently greater in SBR peanut than most other crop phases, particularly conventional cotton, at 0-1 feet deep in the soil profile (Figure 4). Ring nematodes abundances crashed below 1 foot deep in the soil profile. This highlights that there is no perfect crop rotation for all nematodes. Sod-based rotation works well for reniform nematode because peanut and bahiagrass are non-hosts. Based on results of this study, cotton is a poor host of the ring nematode population at this site, so the 2 years of cotton in conventional rotation work better than SBR for reducing its abundances. Further analysis will be done on the impacts of ring nematode on yield, but they are expected to be minor based on other literature. However, these trends highlight the importance of knowing the nematodes in a field and how a particular rotation may affect them. It also suggests ring nematode will easier to manage than reniform nematode with management strategies that affect shallow layers (such as nematicide application). For fungal-feeding nematodes, initial results support our hypothesis that abundances will be more robust in SBR, but do not support the clause of the hypothesis that differences will be more apparent deeper in the soil profile. Consistently across seasons, at the 0-1 foot soil depth, fungal-feeding nematode abundances were greater in bahiagrass, particularly 2nd-year bahiagrass, than any other crop phase (Figure 5). Deeper than 1 foot deep in the soil profile, there were no differences among crop phases and nematode abundances were much lower than in the 0-1 foot depth. In general, trends for bacteria-feeding nematodes did not match with our hypothesis either. 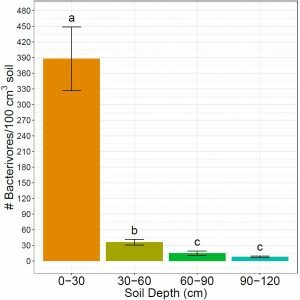 Similar to fungal-feeding nematode abundances, bacteria-feeding nematode abundances were greatest at 0-1 feet deep in the soil profile and were insubstantial below 1 foot deep in the soil profile (Figure 6). 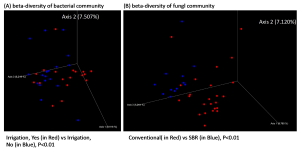 Crop effects on bacteria-feeding nematodes were generally not biologically meaningful as effects were more pronounced deeper in the soil profile, but overall abundances were very low. Our hypotheses for this objective were: (1) Sod-based rotation will manage plant-parasitic nematodes sufficiently without nematicide application; (2) Nematicide application will reduce populations of non-target, beneficial nematodes and microbes. All anticipated samples for cotton and the 2018 samples for peanut have been collected at this time. All nematode samples have been extracted and counted. Preliminary analysis has been done on cotton data. 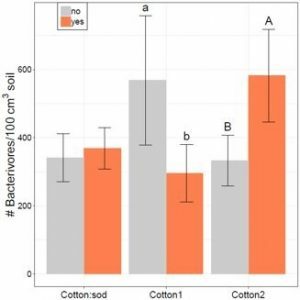 Sod-based rotation significantly reduced reniform nematode abundances in soil and roots compared with conventional rotation (either 1st-year or 2nd-year cotton). This trend was consistent across seasons and years and results for midseason 2017 and 2018 (Figures 7 and 8). Figure 8. Midseason 2018 rotation effects on reniform nematode abundances. (Treatments with different letters are significantly different, P<0.05, Fisher’s LSD). 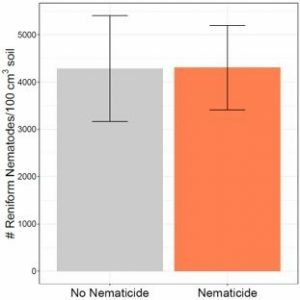 Application of nematicide (Velum Total) did not significantly affect reniform nematode soil abundances in either 2017 or 2018 (Figures 9 and 10). Nematicide application affected reniform nematode abundances similarly in both SBR and conventional rotation. Nematode abundances should be viewed as only a portion of the picture when it comes to nematode management. Early season nematode control may lead to greater root growth and ultimately higher nematode abundances despite nematicides protecting from nematode damage. In both 2017 and 2018, cotton yield was greater in sod-based than conventional cotton (1644 vs 1372 lb/acre lint in 2017 and 1815 vs 1708 lb/acre lint in 2018), but yield response to nematicide application varied by crop rotation. In 2017, there was not a significant yield response to nematicide application in the higher-yield treatments with less nematode pressure, namely cotton following bahiagrass and 1st-year cotton in the conventional rotation. In 2nd-year conventional cotton, there was a significant yield increase with nematicide application which would have resulted in an economic return of approximately $120/acre (Figure 11). In 2018, there was no positive yield response to nematicide application in any rotation phase and nematicide application decreased cotton yield in sod-based rotation (Figure 12). 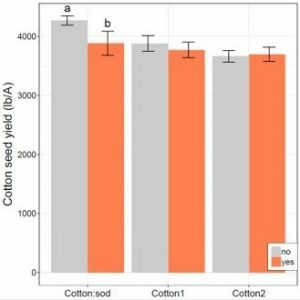 The cotton yield results from this study, particularly 2017, provide evidence to support our hypothesis that sod-based rotation adequately manages reniform nematode without nematicide application. Namely, in this study, nematicide application did not provide any value for increasing cotton yield or managing reniform nematode in sod-based rotation. Reniform nematode abundances were low in sod-based rotation and yields were high, suggesting that reniform nematode was already adequately managed by rotation and that nematicide application may not be needed in sod-based rotation. In conventional rotation, there was some evidence that nematicide application was helpful, namely for increasing yields, although a case could certainly be made that nematicide application was relatively ineffective in any case at this site. 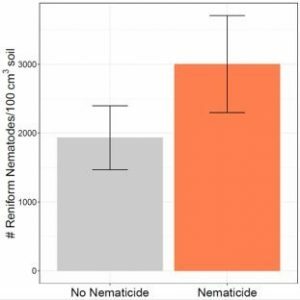 In general, nematicide application did not have a consistent impact on non-target, beneficial nematodes. Bacteria-feeding nematodes, one of the major groups of beneficial nematodes, were the group most commonly affected by nematicide application. In summer 2017 and fall 2018, bacteria-feeding nematodes were affected by nematicide, but the impact varied by crop rotation phase. 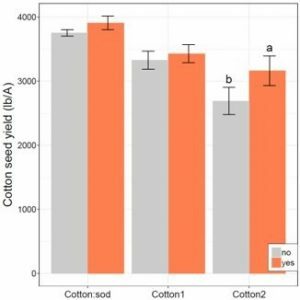 In summer 2017, nematicide application decreased bacteria-feeding nematodes in 2nd-year conventional cotton, but increased them in SBR cotton (Figure 13). 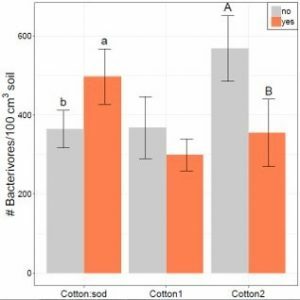 In contrast, in fall 2018, nematicide application increased bacteria-feeding nematodes in 2nd-year conventional cotton, but decreased them in 1st-year conventional cotton (Figure 14). 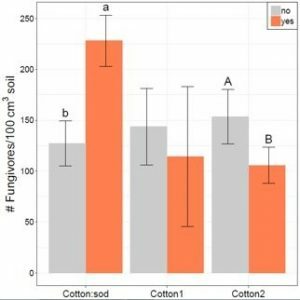 Similarly, in summer 2017, fungi-feeding nematodes were increased by nematicide application in SBR, but decreased in 2nd-year cotton (Figure 15). Figure 13. Midseason 2017: Impacts of nematicide application on bacteria-feeding nematodes varied by crop phase. In summary, our initial results suggest that impacts of this particular nematicide on non-target nematodes is relatively minimal. A possible explanation for these trends is that different genera of nematodes (even of the same feeding habit) are predominant in the different crop phases and that sensistivity to nematicide varies by nematode genera. Further analysis will determine if this is the case. It also worth noting that nematicide application was not particular effective in reducing abundances of target, plant-parasitic nematodes either, so it is possible that overall nematicide activity was not high in this trial. 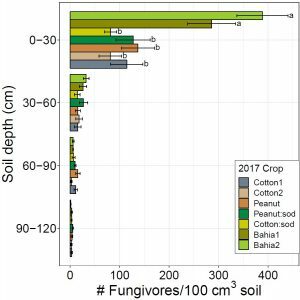 Microbial community structure has been analyzed for preplant 2017 soil. The community structure of highly abundant microbes was not significantly changed (analyzed using Weighted UniFrac, data not shown) was not changed by crop rotation, irrigation, or nematicide treatments. However, the community of lower abundant microbes with lower abundance responded differently to some treatments (Figure 16). For example, the diversity of bacteria significantly responded to irrigation. The diversity of fungi significantly responded to SBR. Figure 16. Preplant 2017: The community structures of microbes were investigated using pre-planting 2017 soil. The bacterial 16S (A) and fungal ITS1 (B) amplicon sequences were performed for the analysis and Unweighted UniFrac analysis was used to generate this figure. Unweighted indicates the qualitative variants of UniFrac (P<0.01). Here the distance between two dots represents the difference of low-abundance features between two soil samples, in terms of presence or absence of some particular microbial taxa. Although the structures of whole microbial community (with high abundance) may be relatively stable across the treatments, we hypothesize that some of the key microbial groups in associated with nutrient cycling are affected by SBR. Thus, the community structures of microbes in associated with nitrogen cycling were further investigated using pre-planting soils (April 2017). In general, Nitrospira, a group of nitrite-oxidizing bacteria (NOB), was more abundant in the SBR system (Fig 17). Additionally, Nitrospira abundance was also high in the second-year cotton plots of the CR without irrigation. The soil samples across different time points will be further examined in order to understand the dynamics of beneficial microbes in associated with SBR systems. Figure 17. 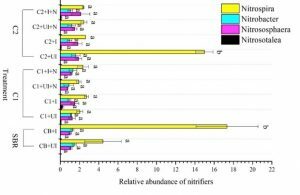 Preplant 2017: The relative abundance of the nitrifiers among different treatments. Different letters represent significant differences in treatments at P < 0.05. CB- cotton in SBR, UI-unirrigated, I-irrigation, C1-first-year cotton in the conventional rotation, N-applied nematicide, C2-second-year cotton in the conventional rotation. 7 Other activities include a variety of small group meetings with farmers or agricultural professionals at Florida county meetings or ad-hoc. As indicated above, much of our extension and outreach came in the form of workshops and field days. A number of field days are held regularly throughout the year at University of Florida research stations. The extension specialists on this grant (Dr. Grabau, Dr. Wright, and Dr. Small) regularly speak or hold discussions at these field days about incorporating bahiagrass into crop rotation, including the most recent research on the topic and resources available to growers. Workshops generally include hands-on training in sampling for nematodes, viewing nematodes, and information about nematode management including sod-based rotation. Most of the presentations listed above are at Extension events for farmers or in-service training for Extension Agents. Some of them are research presentations at various conferences or events such the annual Society of Nematology meeting, the UF/IFAS Research Forum, and the Tri-state climate change meeting. In the coming year, we plan to continue with presentations, workshops, and field days while adding some new components. In 2019, we will initiate on-farm nematode sampling and related extension efforts with cooperators. Now that the majority of research results have come in, we also plan to initiate an UF extension publication (EDIS) on nematode management in sod-based rotation. Growers reported that they planned to change their nematode management practices based on nematology extension, including sod-based rotation. Growers reported they anticipating cost reductions of at least $5/acre based on nematology extension related to this project. The extension assessment portion of this project is still underway. Initial outcomes of this project include that of 114 agricultural professionals surveyed in the panhandle area, 52% of them reported they would be changing their nematode management practices and 70% anticipated cost savings of $5/acre or more based on nematology extension related at least in part to this project. Initial research in this project has given agricultural professionals practical information on crop rotation and pesticide application, that if adopted, will lead to improved profitability, better nematode management, and lesser impacts on the environment. Efforts to distribute this information and work with growers are already underway. In the last two years of this grant, those extension efforts will continue and more quantification of the resulting impacts will be made.